As technology has rapidly evolved over the years, the evolution of ecommerce has not only transformed the way consumers shop. Marketers also need to evolve email marketing. It’s been a slow process moving away traditional ways of email marketing—batching and blasting the same message to every user—and adopting more contextual email marketing programs. The reasons why it’s so critical to increase contextualization in email? 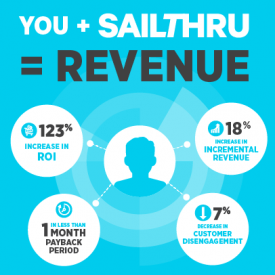 It increases engagement, revenue and fosters a superior customer experience. All of this may sound difficult, but it becomes easily possible with the help of marketing automation. The future of marketing is all about 1:1 personalization driven by automation that are based on cross-channel behaviors and interest. This powerful combination of explicit behavioral data (ex. Last time purchased, webpages visited) and implicit interest data (ex. Likes red shoes, black dresses) is the oil that fuels the automation engine forward. Using email marketing automation software, you can design a wide array of automated email marketing campaigns. You can send automated and targeted emails based on when the individual likes to shop, on what device, and specifically what he/she is interested in, or when the customer abandons shopping carts. Armed with a detailed and accurate data set for each user, brands can personalize communications across channels and greatly increase purchase conversion. Create a “single customer view” of key data points for every individual consumer. Offer advanced segmentation, based on a consumer’s propensity to perform certain actions. Deploy personalized email messages based on data from email, onsite, and mobile data. Leverage real-time automated reports and marketing analytics. Using our new predictive intelligence technology, you can find out which of your customers are likely to buy, how much they will spend, etc. and personalize messages and incentives accordingly. Learn more about how email marketing automation software can improve your marketing ROI in our Predictive Intelligence ebook.